This recipe is pretty special to me. My sweet friend Suzanne was telling me about a cookie her mom used to make before she passed away and I decided I wanted to try to replicate that cookie for her. She told me what was in it including all the qualities that mattered. I got to work and after a couple tries it came out perfect. She said it was just like her mom used to make and that made me happy. I love that food can do that- bring back a memory or remind you of someone. Now she’ll be able to make these whenever she wants. These cookies are not for the faint-of-heart. Each ball of dough is 1/3 cup and the whole batch only makes 8 cookies. They are huge and remind me of those specialty cookies you buy at bakeries. That’s not a bad thing! They make the perfect gift because they are so big and look very impressive. Good thing is, they are super easy to make! One thing that can happen when making oatmeal cookies is that they can come out flat and thin. I know because it has happened to me many times! I played around with the measurements and also added a super helpful ingredient- cornstarch. I’ve used it in chocolate chip cookies to keep them thick so I figured it would also work in these and I was right. These cookies are super thick and so chewy- perfect!! Also, because of the cornstarch there is no need to refrigerate the dough- a step most cookie recipes call for. 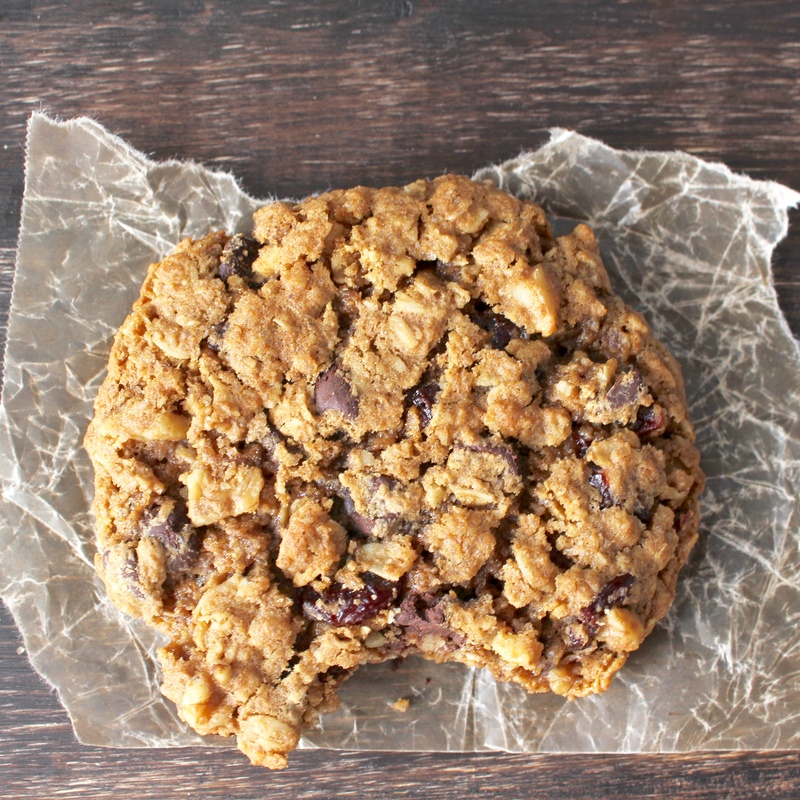 You will love this cookie because it is so big, chewy, soft, and easy to make. A classic made bigger and better. You’re welcome, Tammy! Thanks for trying them! Yummy! A huge hit with the family. 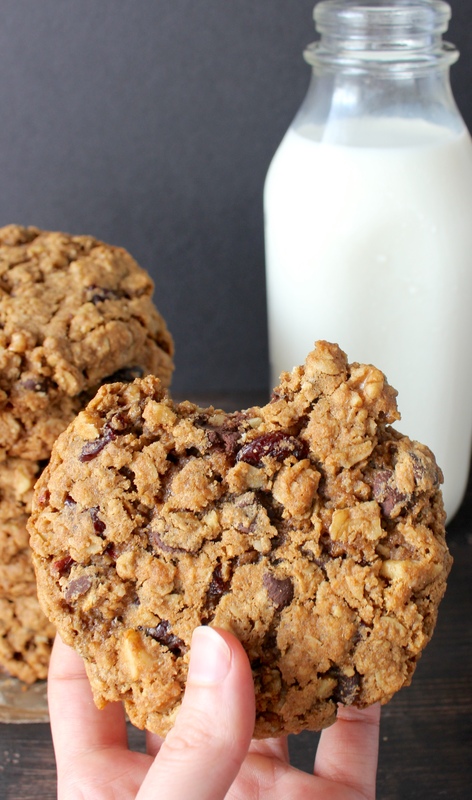 I am going to ditch all my other oatmeal cookie recipes! I didn’t have any of the add-ins, but I did have fruit and nut trail mix. I used equal amount of rough chopped mix as a substitute for the add-ins. Perfect, since we don’t do chocolate anyway. Thanks for trying them, Kathy and I’m so glad you like them! 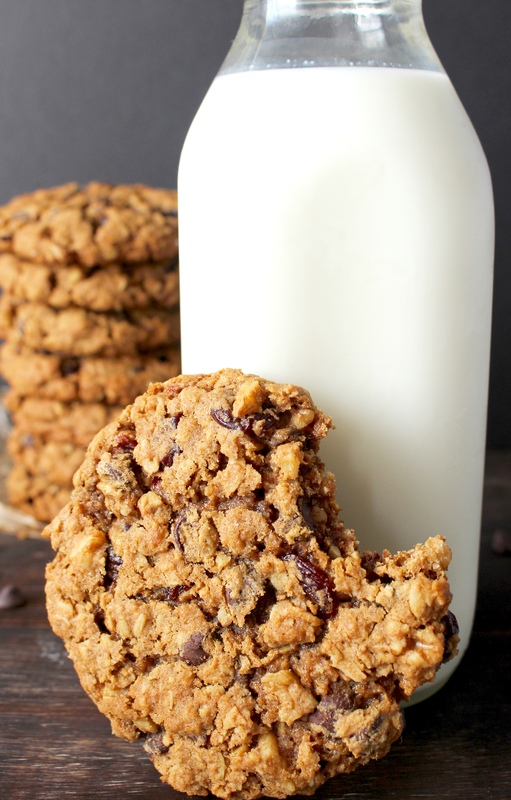 My husband loves oatmeal cookies….and your recipe was a hit! By far the best I’ve had. Easy to make and even easier to enjoy. I substituted cherries for raisins as it’s our preference to have oatmeal raisin cookies.